I’m going to be honest: today is all about the season 5 premiere of The Walking Dead. Tonight, 9pm EST on AMC. The Walking Dead. Who’s with me?! Okay, okay, I’m going to share a nerdy factoid with y’all today. Of course, if you’re drooling over this recipe (like I am as I write this! ), then just scroll to the bottom and get cooking! Lu affectionately calls me a nerd. It’s kind of a joke between the two of us. The main reason? I’m a huge Buffy the Vampire Slayer fan. While the series is over, I still revisit my DVDs (I’ve got all seasons, duh!) and whenever it comes on a syndicated channel, I geek out and have to watch at least 5 minutes. I know every lyric to their musical episode and admittedly, every single one of my Jansport backpacks in middle school were monogrammed with Buffy…. my name is Ali. Enough said, there. So, you see, I’m really into The Walking Dead because, I love everything remotely haunted. Halloween is my absolute favorite holiday, although I always choke in the end and never have a great costume. Since college, I’ve only dressed up a couple of times and the first time was for work and I was Snow White and the second time, I was Mark Sanchez. Nothing exciting. 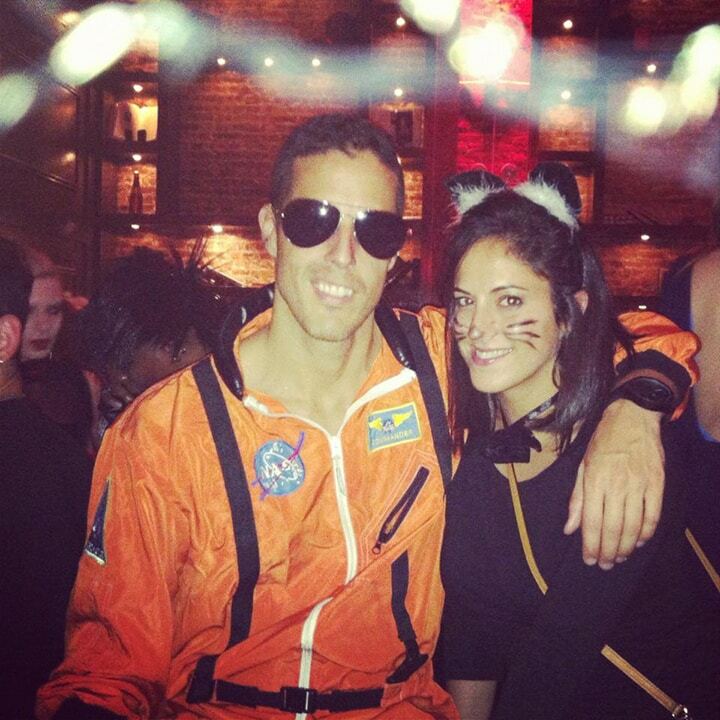 Actually, the last time I dressed up for Halloween was the weekend of Hurricane Sandy. The storm was coming, but since Lu’s birthday is on October 30th, I wanted to be festive and go out and keep the spirited celebration. I wore a black dress and stockings and on the way to some nightclub in New York City (I was living in Hoboken at the time), I stopped at a Halloween store and bought kitten ears and drew whiskers on my cheeks. How predictable. This year, I’m determined to dress up and really embrace the Halloween spirit. Two of my best friends (and bridesmaids!!) are in town, so what greater reason to celebrate than spending time with friends that aren’t always around? Now, for the recipe. This is absolutely something you could make as a Thanksgiving side. 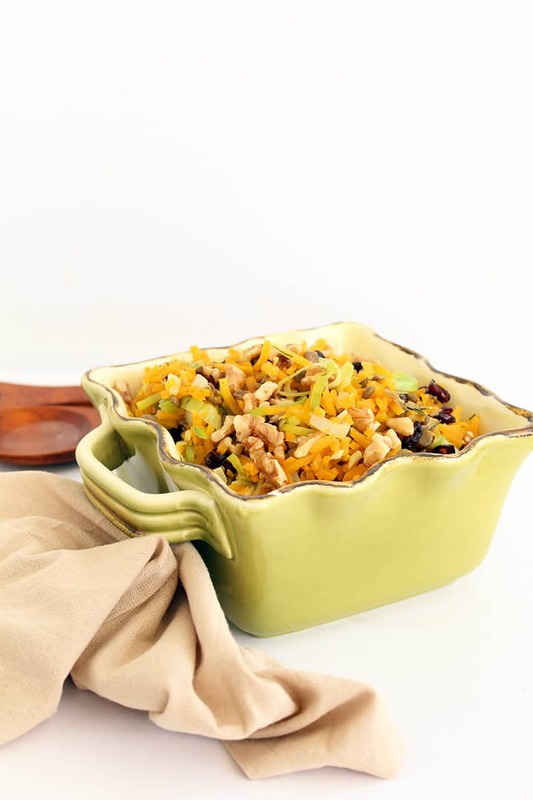 Consider it like a pilaf – with lentils, rice and sweet veggies and fruits. The leeks do wonders in this pilaf and the lentils offer a thick texture and a healthy source of protein. My favorite? The cranberries! It’s crucial when you’re buying dried fruits to read the ingredient list. You’ll find a whole slew of unhealthy add-ons if you’re not careful (ie sugar.) Try to find ones that are sweetened with apple juice, instead of sugar. If you can’t, they might be a little tart OR they’ll have refined sugar (if you can’t find one without sugar, try to find one that says “organic cane sugar” or “evaporated cane juice.”) You can’t always win ’em all! This pilaf is also soft and fluffy, perfect for pairing with that Thanksgiving roast or even Thursday’s pork chops. 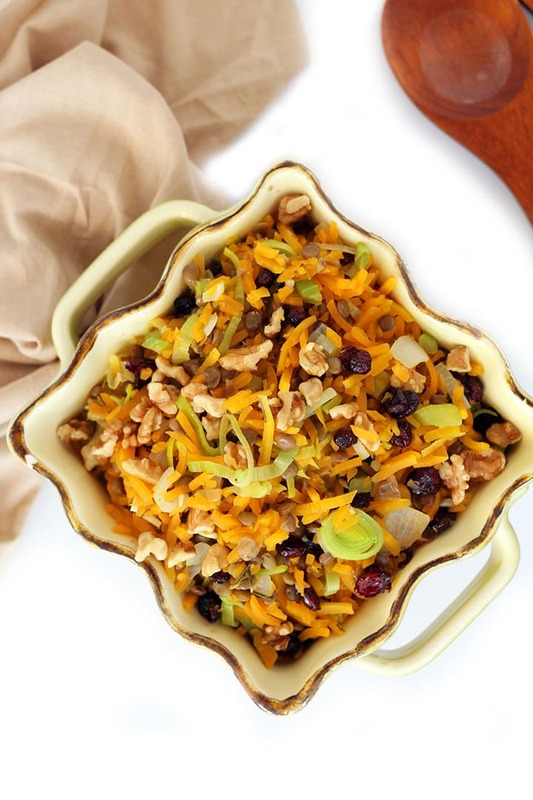 Your friends and family will appreciate the healthy side dish (instead of an icky casserole.) 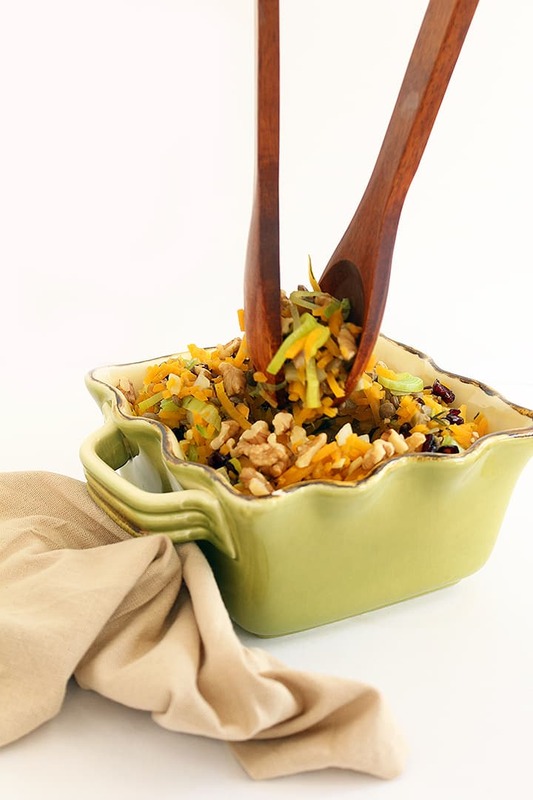 Or, just save it for a fall get together- this pilaf has rich, savory flavors that will warm you up and make you feel great afterwards. If you haven’t forgotten about my Buffy the Vampire Slayer days and still love me, then, well, I love you too. A la Taylor Swift, we just need to embrace ourselves and shake it off! What are you being for Halloween? Inspire me! Place lentils and water in a medium saucepan and bring to a boil. Once boiling, lower to a simmer and cook uncovered for 30-35 minutes or until cooked through. Add more water to always slightly cover the lentils, as needed. After lentils are cooked, place the butternut squash noodles in a food processor and pulse until rice-like. Set aside. Dice the Vidalia onion, celery and mince the garlic cloves. Set aside. Place a large skillet over medium heat and add in the olive oil. Once heated, add in the garlic and rosemary and cook for 30 seconds or until fragrant. Add in the celery, onion and leeks, cook for 2-3 minutes or until onions are translucent and then add the butternut squash rice and season with salt and pepper. Stir the butternut squash rice to combine and cover and cook for 5-8 minutes, shaking the pan occasionally, or until cooked through (taste.) If the squash is still crunchy, cover the skillet and cook for 2-3 more minutes. 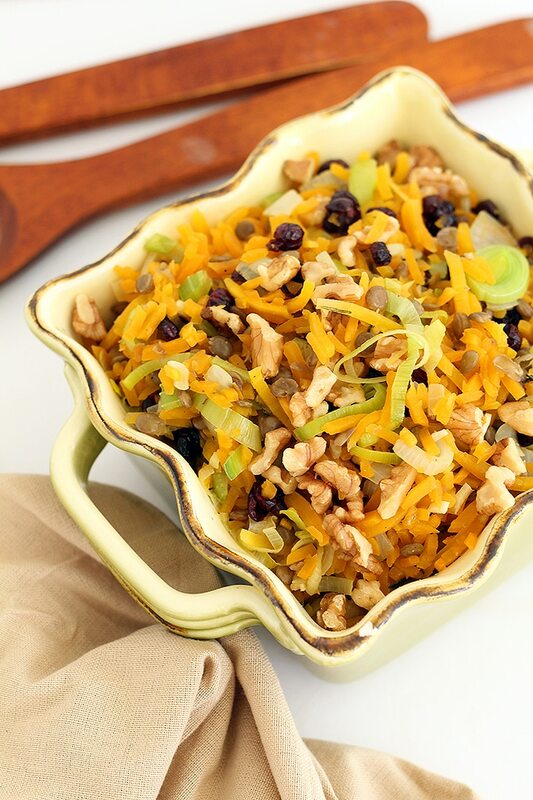 When done, add in the lentils, walnuts, cranberries and stir to combine for 1-2 minutes to warm up the cranberries. Serve immediately. Where are the dressing ingredients listed? "Pilaf" doesn't have a dressing or sauce. This sounds flavorful as is. If it is too dry for you my guess is you could thicken a little chicken broth in the sauté onion step. Or better yet have some broth ready to thicken with arrowroot or cornstarch just in case you don't like the moistness of the dish when it is finished. Hope you try it though. This sounds delicious and who doesn't love Buffy?! I shall use pecans (walnut allergy) and orange flavored cranberries, might not be what is recommended, however we love them and rarely imbibe! All the rest sounds great to me! why would you need a dressing? sounds delicious as is. Looks so yummy I can't wait too try. I'm big on Halloween having lived in Salem, Ma for the first 25 years of my life and still hang out there frequently. I'm going as a hula girl this year! I'm have a difficult time "noodling" butternut squash. I'm afraid I''ll break the handle. It seems super stiff with a lot of tension. Any suggestions? I made this tonite and it was soooo good! I added some cooked sweet Italian sausage, and used precooked lentils from trader joes! I also used pecans instead of walnuts. I will definitely make this again. Thanks so much! 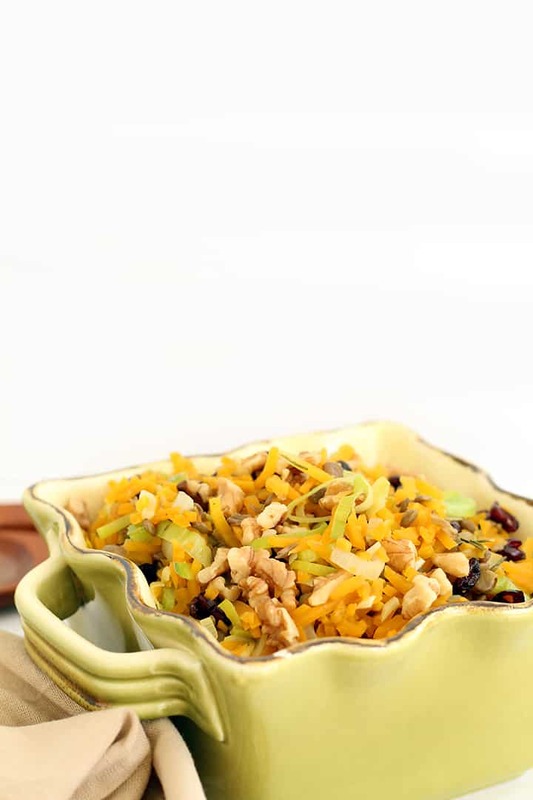 I tried spiralizing buttermit squash, and it was too hard... I couldn't get the handle prongs to stay imbedded in the squash, and it woudn't make noodles, after trying several ways to try and push it through Blade C...it came out as a 'disc'... I, too was afriad I'd break the spiralizer... any suggestions?' Would microwaving it a bit first, make it softer? do you think that would work? Thank you so much for your reply.. will certainly give that a try... how long do you leave it in the oven? and have you already peeled it and cut it into the pieces for spiralizing? Thanks. M.
I did butternut squash once in my Paderno. It was just too tough and I was afraid I would break my favorite gadget. The next time I used my food processor with the grate disc and then pulsed the strands as you suggested for making them rice sized bits. Results were not quite as beautiful as with the Paderno squash strands but that's what I'm going to do with butternut squash just as a precaution. Love, love, love your recipes. Helps my family enjoy the pros of more veggies and avoid the cons of rice and pasta. check out Christine's suggestion above for softening abit int he oven, or try the M/W for a little bit. Hi Ali, I am going to be moving to Senoia, Georgia, where they film The Walking Dead! We already bought a house in Senoia, 10 minutes from where they film! The have a cute historic downtown area there too. It is all the rave in Senoia!